This week, we saw the world through kitty shaped glasses, Tati Ferrigno's cats just wanted to have fun, Ni-Hao the kitten who survived a 6,500 mile journey in a shipping container, meowed for the first time, a UK shelter attempted a world record for the largest gathering of people dressed as cats, fondant kitty cupcakes from the Netherlands were (almost) too cute to eat, and we went Around the World in 80 Cats to Alaska, where we met one town's feline mayor who has been in office for the past 15 years! Elsewhere, don't forget to enter for your chance to win a set of 3 organic catnip kicker toys from Whimsy Kitten! They're super cute and have little felt glasses, you guys! Click HERE to enter! This week's featured feline was rescued as a starving, injured kitten, and blossomed into a healthy cat who is still going strong at the ripe young age of 18! Amazing! 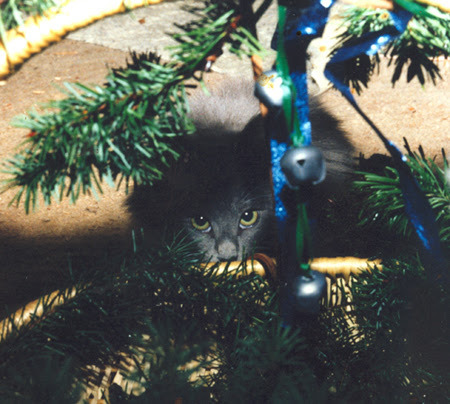 The first photo is of Samsun as the tiny and wary kitten we found under our house one cold winter, truly a Christmas gift from the Goddess. He was only about 6 weeks old, starving, and had a broken hind leg. We thought he had been born to a feral mom and perhaps been left by her as he had hurt his leg. We often wish he could have told us his story! The vet said he would not have survived another night on his own. We weren't even sure he would survive, so he was dubbed Mr. X for a few days, but once his leg was set and he got some food into him, he was quick to move into his new home and begin terrorizing our older cats! It was then we named him Samsun, for the little ruff of fur around his neck and for his mighty attitude! 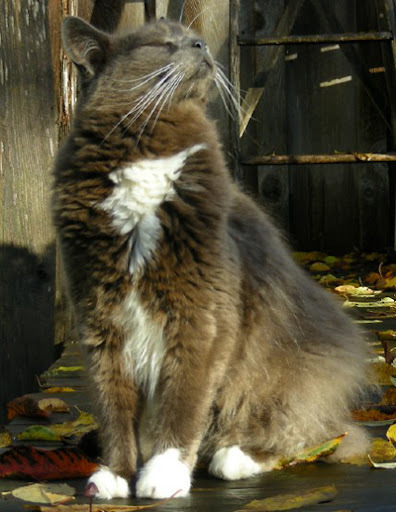 The second photo is of Samsun taken last fall, at age 18. He is still in amazing shape for his age, slowing down a bit of course, and his injured leg has come back to haunt him. He sleeps the day away on the sundeck and still goes out mouse hunting by the woodshed in the late afternoon. He is quick to swat either of the dogs if they don't move out of his way fast enough. He is very shy of people he does not know and is still our pushy and spirited boy! Special thanks to Carol for sharing her smashing senior kitty with us this week! Samsun is looking just as handsome as ever, and we wish him many more happy years of napping, swatting, and hunting mice in the shed! p.s. Looking for even more Catsparella? Check out my weekly columns over on Catster! Want to see your cat(s) on Catsparella? I'm always taking submissions for my weekly Caturday post! Just email your best kitty pics to catsparella@gmail.com, and include your cat's name and anything else you'd like to share! I can't wait to hear from you! So glad to see the Ni Hao update. And we've been voting for you daily! What a wonderful story about Samsun - Carol is a dear friend of ours and we know just how much this special cat has enriched her life. Samsun sure is a handsome guy! Whimsy Kitten Catnip Toy Set Giveaway Winner! Whimsy Kitten Catnip Toy Set Giveaway! Miss Minoes Is Now Available On DVD! RC Tees Real Men Love Cats T-Shirt Giveaway! The 2012 Itty Bitty Kitty Committee Fundraiser!